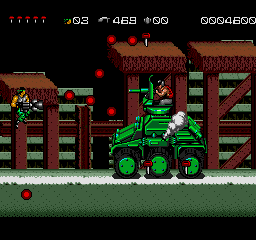 Midnight Resistance is a run 'n' gun game that was originally released in the Arcades in 1989. Playing as a former narcotics agent, your mission is to rescue your family from the Crimson King and topple the drug lord's empire. Your standard weapon is a pea-shooter, but collecting keys from downed opponents allows you to obtain additional firepower at the end of each level (such as a 3-Way spread and a Shot Gun). Powerful secondary weapons are also available and include Homing Missiles and circling Barriers. Comparisons to Contra (1987, Arcade) are inevitable, but this does have a number of standout features, particularly the option to rapid fire your weapon without having to hold down a button; this greatly enhances another innovative idea which is the ability to lock your direction of fire. Both give you massive amounts of freedom when tackling the onslaught of enemies, and it helps that everything is ultra responsive. The level design is also terrific with lots of horizontal and vertically scrolling areas to keep you guessing, and unique ideas such as Stage 3's staggered platforms that gradually rise as you battle flying enemies. Another fantastic idea is the weapon upgrade system which provides tons of strategy and helps with replayability as you work out the best firepower to use in each level. What also motivates you to come back is the need to collect enough keys to free all family members prior to the final boss; although you can beat the game without freeing them all you won't get to see the good ending. There are a few problems though, mainly the absent two-player mode from the Arcade version, and the fact that the high difficulty is clearly in place to disguise the game's short length. Midnight Resistance is a thrill-ride from start to finish thanks to its non-stop action, precise controls, satisfying weapons and interesting level design. The harsh difficulty might put some people off, but those that take the time to learn enemy patterns and optimal weapon upgrades will find a lot to love here. Random trivia: Ports were also released for numerous home computers, including the Commodore 64 (1990) and ZX Spectrum (1990).